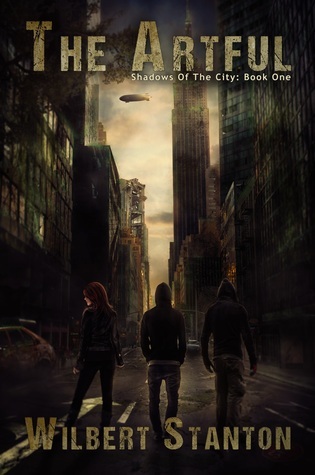 Today’s guest post is by Ellery A. Kane, author of the Legacy series. 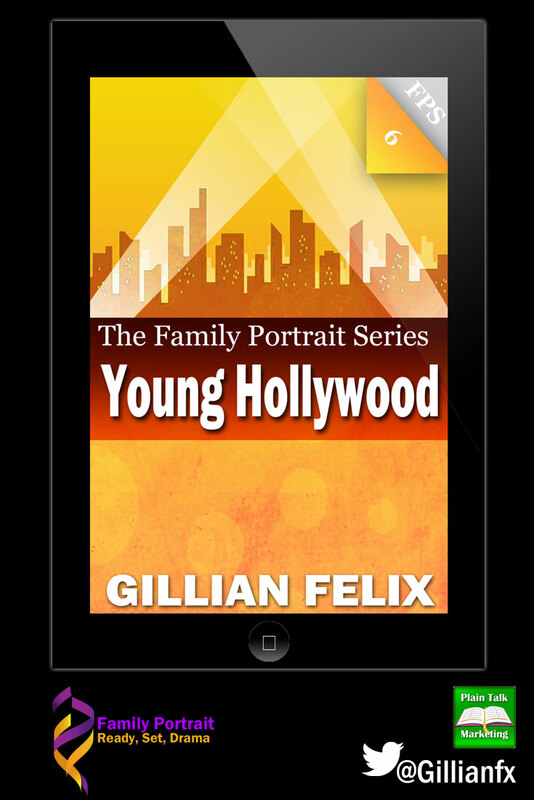 Ellery talks about her writing journey. Let’s face it folks, we all have a writing journey. Share yours below in the comments section. My love for writing began early. As an only child, I told stories to entertain myself, and in high school, I started writing short stories just for fun and sharing them with my English class. I loved the experience of creating with words the exact feeling or image or moment that I intended and watching those words resonate with others. That is powerful. It made me want to be an author. Still, I never seriously considered writing as a career. Instead, I became a forensic psychologist. For almost seven years, I spent countless hours writing psychological evaluations—analytical, logical stories explaining how a person came to be who they are. In the recesses of my mind, I always knew I should write creatively again, but I worried that I wouldn’t have the energy or time. Then, in March 2014, that little spark caught fire, and I decided to seize the day. I sat down at my computer and wrote Legacy’s prologue. At the time, I had no idea what it would become. Certainly not a book! I had never written fiction longer than five or six pages. At first, my writing was painfully slow (think one sentence per hour) but then it was faster, and faster, and faster. I found myself waking up early to write; having brainstorms in the middle of the night or in the shower; and quickly filling the pages. In the span of about six weeks, Legacy was born. 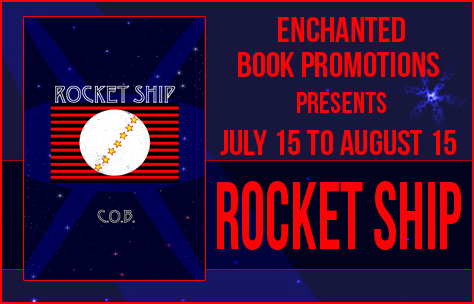 Rocket Ship is C.O.B.’s first young adult novel, but his third book overall. His first book, Hope(less), was a literary fiction about the journey a young couple endures for love. 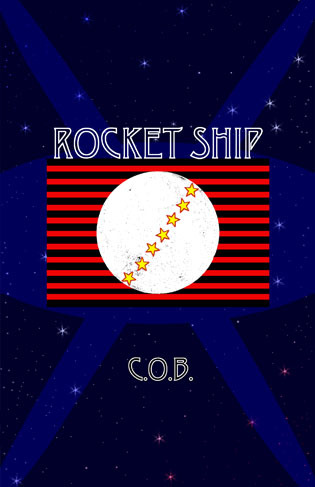 C.O.B.’s second book was a collection of works that included poems, short stories, and even a heartwarming tale told via screenplay. New York City 2025 isn’t the place of glitz and glam that it used to be. The city that never sleeps is pretty much the city that never breaths. No more tourists blocking up Times Square, taking pictures of God knows what. No longer are the trains filled with both late passengers and uncomfortable smells. There’s no more hustle and bustle… there’s rarely a bustle. But most noticeable is the silence, the silence that fill the city streets is quite unsettling. That being said, if you, dear reader should still choose to visit New York City, here is a handy guide of things to avoid and sites to see… before you die of sickness, or scavenger attack. Grand Central: Grand Central was once a busy station where people came in and out of the city. Travelling on business or pleasure, it didn’t matter, this was a mecca of diversity and you could see it all here; people from all walks of life as they travelled about their day. Now, Grand Central is a shanty town made up of people who were lucky enough to find its safe dwellings. Only accessible from the subway stations and treacherous tunnels of the underground, it offers a great sense of security. It is also said to be where the Gutter Punks make their home. Central Park: What was once a beautiful park situated in the center of the city is now a wild land. Over grown with unkempt vegetation and reckless abandonment the park is not what it once was. It is overrun by the ferocious beasts that were once confined to cages of the Central Park Zoo, but now prowl the shadows looking for a human feast. The park is also the home of the Runts, a group of feral children who live like a pack of wolves. Their alpha, a boy named Peter, is said to be a child prodigy who protects his cubs, not with strength but intellect. Union Square: It was where all the artistic people hung out. Skaters, artists, people competing in games of chess while street entertainers played instruments behind their hungry tip jars. Now it is home to The Tribe, modern day hippies, who flock to the flag of their leader Red, a woman who can wield a sword as easily as a smile. The Tribe spends their days passed out in drunken heaps while their nights are filled with paryting, music and storytelling. They are a fun bunch but when the call to war is upon them they will easily pick up arms and protect their own. The Cathedral of Eden: The vast cathedral takes up a number of city blocks; the place of worship is now host to the Sons of Adam, a religious cult that follows their leaders Adam and Eve with a sick ferocity. Followers of the faith are known as Angels, mostly reformed criminals seeking salvation during the end of times. This is a place one must steer clear at all costs. If you are not quickly indoctrinated and seen as a follower, your death will not be pleasant. Beyond the Brooklyn Bridge: There are many rumors as to what waits in Brooklyn. Lord Chrysler rules the borough with an iron fist. The well-to-do live at its center but to get there you must first pass through savage lands run by Skinlickers, heavily pierced and tattooed men and women who relish the taste of human flesh. If you should be so lucky to make it past them, you’ll have to deal with the Slavers who make sport of catching errant men, women and children to sell into slavery or for unwilling contestants in the Barclay Center arena. Once you have made it past them, what waits is a land of beauty and wealth. A land not seen by many who live outside of Brooklyn. Kia Carrington-Russell is a young author working on her first series: The Three Immortal Blades. 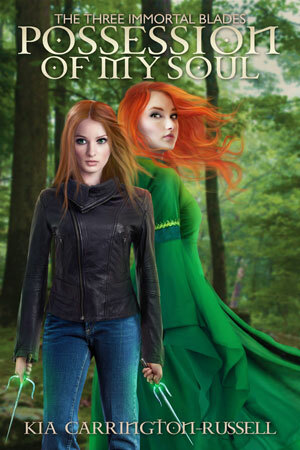 Kia began writing at the age of fifteen in high school- finding that all her warped and strange dreams were giving her a fantastic new world- and since then she has never looked back. Kia Carrington-Russell was born in a small town in Australia, moving around a lot at a young age until finding a stable town where she finished her schooling. Kia found herself enjoying and expressing herself through poetry, short stories and writing, photography, painting and drawing. All these mediums help Kia express the different world that she is so fond of. Kia now focuses on her photography, writing and self-help blogs on her website: ‘Precious Living’. She writes in her Australian home, trying to focus at times on simply what is running through her head, as her cats either terrorize her legs as scratching posts or her puppy barks in her ear for play-time. 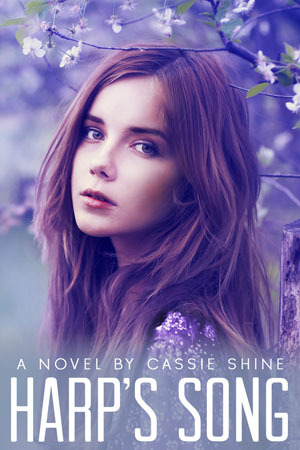 As she continues her series, they grow with her book. 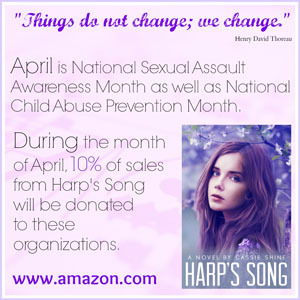 Harp’s Song explores very important issues and April is the National Sexual Assault Awareness Month as well as National Child Abuse Prevention Month. What cultural value do you see in the writing/reading/storytelling/etc? Writing and reading are important for learning, about both ourselves and our societies. In my novels, the main character must face some sort of external challenge. She’s just an average girl, but circumstances beyond her control have put the world on her shoulders. When readers watch how she manages this challenge, they see values of strength, courage, and determination. When I write in these qualities, I wonder if I could handle the situation as well as the main character. Novels give us an opportunity, as a society, to uphold certain values (strength, selflessness) and discourage others (greed, malevolence). As readers and writers, we can test these values in impossible situations–and test ourselves to see if we would measure up. My dream is to see the Northern Lights, which can happen in many different places–I’ll say Alaska is where I want to go. There is so much magic in the aurora borealis, and so much science as well. I’m thinking of a concept for a book that deals with both, so that may be my next stop! 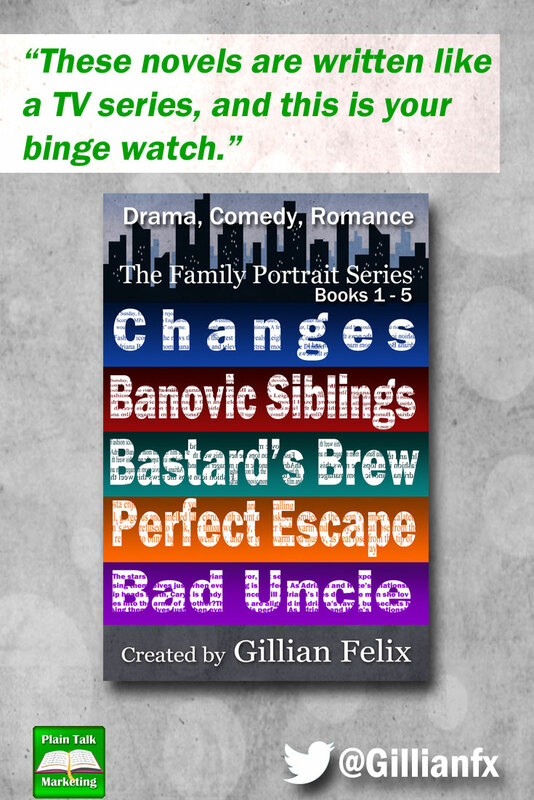 What are your reading and writing pet peeves? I hate when authors use too many adverbs, especially in dialogue. “‘What?’ she asked sarcastically, dismissively flicking her hand.” I think the situation and dialogue should speak for the mood themselves, as much as possible. When I edit my own work, I try very hard to get rid as many adverbs as I possibly can (as many adverbs as possible). I think a good young adult story needs two things, at a minimum–internal and external drama. Internal drama for a character can be a classic relationship struggle. I like this boy, but does he like me? Should I signal to him how I feel? Touch his hand, look at his lips? Did he just send me a signal that he likes me? Have I given my feelings away? These are all very small questions, but they’re the signals my characters need to read between the lines when dealing with a male. For external drama, the character needs to be dealing with something bigger than herself. The tunnel caved-in around Emily, and she has to find a way to survive. Especially when she learns that the people who brought down the tunnel are trapped inside with her. Should she trust Chris? Is he mixed in with the killers? How can she keep her knowledge of their identities a secret? How can she survive? The external drama drives the main plot of the story forward, but the internal drama must be there too. 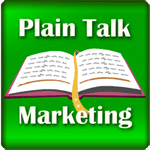 Do you work with an outline or plot or just see where an idea takes you? A little bit of both! Generally I know where I want the plot to go when I start writing–I know the inciting incident, certain events that will follow, and the steps my main character will have to take to survive. I create an outline of the sequence of events, and then I start writing. However, almost immediately the novel decides to misbehave. I wanted Emily, my main character, to feel one way or do one thing, but she decides to do something else. Other characters in the novel jump in and interfere. And by the end, I have a novel that I couldn’t have imagined–and that is in many ways much better! 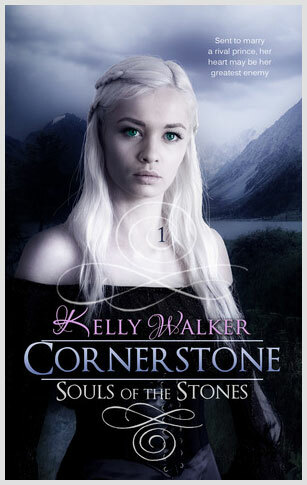 Discover the heartbreaking betrayals, fascinating magic and fated love of Cornerstone. Continue reading..